The ALS Association Western Pennsylvania Chapter was founded in 1982 to serve the needs of those living with Amyotrophic Lateral Sclerosis (ALS) commonly known as Lou Gehrig’s Disease. 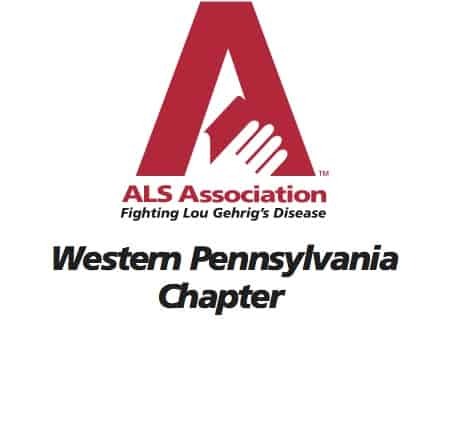 The Chapter provides resources, equipment and medical support to persons living with ALS, caregivers, and families in 31 counties in western Pennsylvania. The mission is to lead the fight to cure and treat ALS through global, cutting-edge research, and to empower people with ALS to live more fully by providing them with compassionate care. The services are made possible by the generosity of others. From the smallest donation to the largest gift, donors touch the ALS community with hope for the future. For more information, visit www.cure4als.org.